Kia's new Sportage is sleeker than the current model. TURIN -- Kia Motors Europe will unveil its new Sportage medium SUV at the Geneva auto show on March 2. The third-generation Sportage reveals a significant shift in design from the current model, moving away from the rugged off-roader look of the first Sportage, launched in 1993, to sleeker crossover proportions. Kia said the new Sportage is longer, lower and wider than the second-generation model, introduced in 2004 and restyled in 2008, giving the latest model a more dynamic exterior look, as well as more space for people and cargo in the interior. Kia UK Managing Director Michael Cole said the first Sportage was the car that made a breakthrough for the Korean brand in Europe and he is convinced that "the all-new version will make people sit up and take notice just as the original did." Kia has not yet released technical specifications of the new model but said it will have a range of highly competitive diesel and gasoline engines. 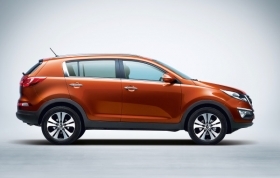 Kia will build the new Sportage in its plant in Zilina, Slovakia. The crossover will be produced alongside its ix35 sister model from parent company Hyundai Motor Co. 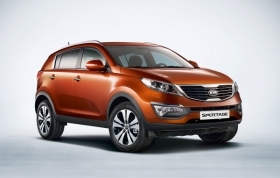 The new Sportage will go on sale Europe in September. Last year, Sportage sales in Europe declined 19.1 percent to 21,330 units, according to estimates from JATO Dynamics, a UK-based market research company. Kia will build the new Sportage in Slovakia. Kia hopes the new Sportage will help to boost its sales in Western Europe to 252,000 units this year from 242,000 in 2009, despite its forecast of a total market decline of between 8 and 10 percent in 2010.